Please select a size. UK 5 - Low StockUK 6 - Low StockUK 9 - Low StockUK 10 - Low Stockview larger sizes Please select a size. 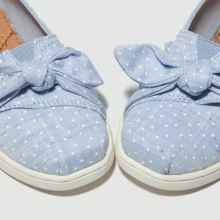 This sweet TOMS slip-on is perfect for the new season with a playful polka dot print and glamorous bow adorning the strap. 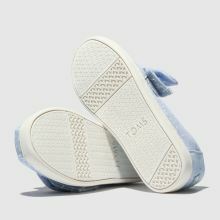 The fresh Classic kids' slip-on boasts a pale blue fabric upper with a handy elastic insert and easy touch fastening foot strap.